The Sept. 11, 2001 attacks on the United States are still vivid in the mind of Dr. Condoleezza Rice. Rice’s words were part of a Thursday, March 21 keynote address at the University of the Pacific’s Advancing Women’s Leadership forum. The audience, consisting primary of women, listened to a multi-hour program devoted to empowering. 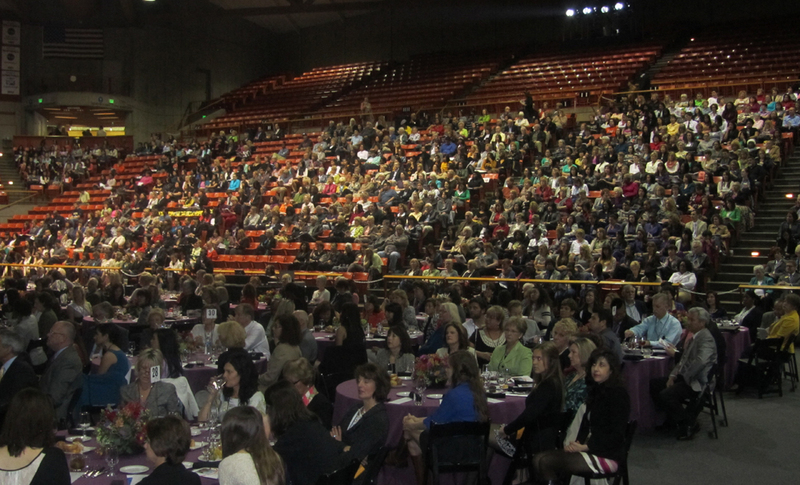 The forum also included a speech by Latina Magazine founder Christy Haubegger. Rice, now a professor at Stanford University in Palo Alto, talked about being alongside President George W. Bush the days following the attacks. It wasn’t easy, she said. “I’ve been national security advisor, you don’t own troops, you don’t own a budget. Then I’m Secretary of State, chief architect for United States foreign policy,” she said. Before she was able to make decisions for an entire nation, young Rice was having difficulties deciding a major. “I was passionate about being a concert pianist. I could read music before I could read,” she said. Dreams of playing piano professionally dissipated. She told her minister father and music teacher mother that she was changing her college major. But it would be almost a year before Rice would decide. Finding something simple was not the objective for her. Rice found her niche in a political science class. When entering a field dominated by men, searching for role models with resemblance was near impossible. White men were her mentors. “Old, white men,” she said jokingly. She told audience members she braved her own path. “There’s nothing when you look at me that says I am a soviet specialist. Had I been waiting for a black soviet specialist, I would still be waiting,” Rice said. Rice said, as a woman, she had to work twice as hard. Being prepared, confident and having perspective is key. “You have to have faith and take it,” she said. Once she reached the pinnacle of Secretary of State, she recalls sitting in a helicopter on the White House lawn with Russian President Mikhail Gorbachev and his wife. Rice also stressed the importance of educating women. 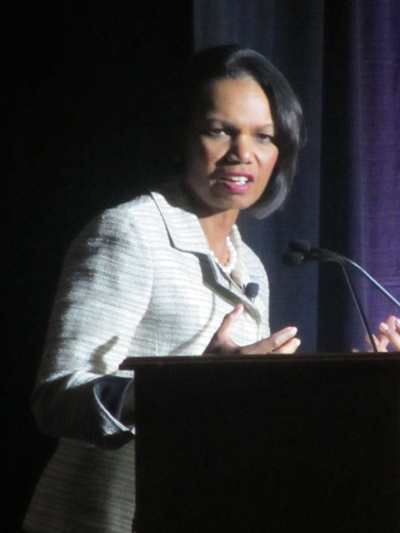 Advocating women’s rights and human rights are vital, Rice said. Everyone must be sure to take advantage of human potential. “If you wish to do something about the population explosion in third-world countries, educate women. If you want to do something [about] the attitudes of men, empower their mothers,” she said. Rice served as Secretary of State from 2005-09, the first African-American woman to hold the title. While serving, she learned the way to succeed was to keep honest people near at all times. Isolation, she said, was easy to get lost in at the top of an organization. Rice learned to trust the right people. “These voices, even the ones we don’t want to hear, are better than the silent,” she said. Iraq was a pivotal moment in Rice’s career. The ultimate goal was to build a democracy. “No human wants to live in tyranny. When they are deprived of their freedom for so long – that’s enough. Saddam Hussein was a cancer in the Middle East. We thought Saddam had weapons of mass destruction … we wanted an Iraq to stop invading its neighbors. The United States struggled for a long time,” she said. The Middle East will become a better place, she said, it will be history who will be the judge. “Iraq looks pretty good in contrast” to Syria, she added. Rice also spoke about her experience visiting the National Archives and seeing the Declaration of Independence during her last days as Secretary of State. “When the founding fathers wrote it, they didn’t mean me. The remarkable thing about that document, it has been flexible enough to include more in ‘we the people,’” she said. Americans ability to freely exercise our rights, she said, is what defines us as a nation. Rice also spoke about the vitality of democracy in the United States. Wearing a tweed skirt suit and a pearl necklace, Rice was tough speaking about leadership and offered advice to the audience. At the end of the event, Rice was presented with the Athena award by University of the Pacific President Pamela Eibeck. The Athena is a now global award with the first being handed out in South Africa this fall. It recognizes accomplished women from all aspects of life.